Chartis unveils a flexible investment managers policy. Only time will tell if the Natural Disaster Insurance Review’s plan will survive the negotiations. Zurich covers the consequences of privacy and data loss. Flooded mines highlight some big problems with business interruption insurance. 16 Caught in the crossfire » Last summer’s disasters highlighted the imbalance between loss adjusters’ professionalism and insurers’ costcutting. More products for the Australian market, and now expansion into Singapore. 56 Lumley updates its management liability cover » Broker feedback leads to even more features for SME clients. 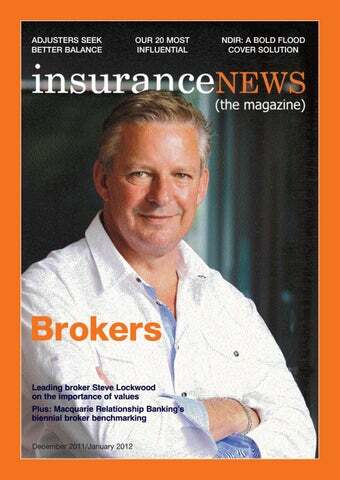 Steve Lockwood is busy giving Wesfarmers’ brokerages some common values. Ironshore moves fast to counter the influences of NZ court decision. 26 Australia’s brokers 2012 » How they’re performing, their challenges and opportunities, ambitions and expectations. 34 Playing his aces » Giles Ward is one chief executive who got some upside out of a tough 2011. 38 The top 20 most influential people in insurance » The people who lead the industry today, because they influence its direction. 46 FOFA: A reform brokers can’t escape » How legislation designed to control rogue investment companies evolved to trip up insurance intermediaries. lawNEWS 50 The Bridgecorp decision » Why a New Zealand court decision is rocking Australian business and insurers – and what to do about it. companyNEWS 52 Finding opportunities in disasters » Excess buydown cover is raising plenty of interest. Staying the distance There’s nothing like a demonstration of confidence to cheer up an unhappy market, and Zurich General Insurance displayed plenty of that in October when it opened its new office building in the Auckland CBD. Insurers’ commitment in the turbulent New Zealand market had been the subject of local speculation lately, but Chief Executive Shane Doyle and Chairman Terry Paradine flew in to spread some cheer. The Christchurch earthquakes “don’t prevent New Zealand being a good place for a capable insurance company to do business”, said Doyle (above right with NZ Country Manager Adrian Rimington, left, and Terry Paradine). Church insurer Ansvar – which has taken a pounding in the earthquakes – announced a few weeks later that it’s pulling out of the market at the end of the year due to the prohibitive cost of reinsurance. Rumours about other insurers quitting grew so strong that Vero NZ Chief Executive Gary Dransfield felt the need to address it during a speech in Auckland to a business group. He says the industry’s future in New Zealand is “very promising”, and insurers are reassessing their businesses “not to withdraw but to build stronger, more sustainable businesses”. However, there are likely to be fewer insurers in the New Zealand market in future no matter what the state of the market, according to ratings agency AM Best. It says that industry consolidation is likely because there are too many insurers for the size of the market, and predicts the dominant Australian insurers will take over smaller companies struggling to comply with a tougher regulatory regime. The cost of NZ’s quakes How much are the gradually declining Canterbury earthquakes in New Zealand going to cost? Late in October the New Zealand Treasury upgraded its estimate from $NZ15 billion to $NZ20 billion. But a couple of weeks later the Reserve Bank of New Zealand brought out its own estimates, which added on such things as insurers’ claims-handling expenses, business interruption, temporary accommodation and other non-rebuild costs. That brought the estimated cost to $NZ30 billion. The bank noted in its November financial stability report that it will be years before the final cost is known, but its latest estimate includes more detailed assessments by insurers. So far the Earthquake Commission (EQC) has paid out home and contents claims of more than $NZ2.2 billion. The bank report says reinsurers will cover 49% of private insurers’ property-related insurance claims, the EQC’s reinsurers another 17%, private insurers 5%, the EQC Fund 25% and government support 2%. The Government’s guarantee of financial support to crippled Christchurch insurer AMI – which is for sale – contributes 2% of the total. “For those insurers operating in New Zealand as subsidiaries of foreign-owned entities, parental support has been evident,” the report says. “Several insurers have had additional capital injected this year.” The bank says although new cover is harder to get – most businesses and households in Canterbury have been unable to change insurers – it believes insurers and reinsurers will eventually reassess their risks and opportunities in New Zealand and a more active market will return in Canterbury. New chairman, new realities John Nelson has replaced Lord Peter Levene as Lloyd’s Chairman, and almost immediately weighed in with a speech warning that tough times are upon the venerable market and they won’t be getting better anytime soon. He told a brokers’ dinner in London that while the supply of capital is still strong, the returns are too low. Nelson and Lloyd’s CEO Richard Ward has written to managing agents outlining a plan to reduce spending by £17 million next year and cutting 60 Lloyd’s jobs. Fall in motor vehicle theft over the past 10 years in percentage terms. Claims professionals around Australia had plenty to say when consumer advice group Choice presented the entire industry with one of its “shonky” awards, a distinction usually reserved for purveyors of crappy Chinese goods. Referring to “thousands of homeowners left high and dry by insurance companies that rejected their [flood] claims. In some cases, policyholders failed to read their policies carefully. In numerous others, insurers made it all but impossible to know whether they were covered for flood or not – or exactly what a ‘flood’ is.” Insurance Council Chief Executive Rob Whelan fired back, accusing Choice of being shonky for a “reprehensible decision to list an important insurance product, which is helping tens of thousands of householders and businesses recover from natural disasters, alongside specious consumer goods”. Of the 130,000 claims made after the Queensland floods and Cyclone Yasi, only 3% were eventually rejected. Home and contents insurance policies are rising higher in disaster-prone Queensland than anywhere else, according to research company Canstar. It analysed 74 policies from 38 insurers through more than 16,000 individual quotes, and found the average home and contents premium has increased in the past year by 12% in Queensland, 7.4% in NSW, 5% in Tasmania, 4.9% in SA, 4.7% in WA and 4% in Victoria. Nationally, 62% of policies have had price increases of no more than 10%, but 31% of Queensland policies have increased by more than 20%. In flood-affected areas, a regional postcode has seen increases of up to 41% while premiums have risen up to 36% for a Brisbane postcode. An impressive 92% of policies now cover flooding caused by rainwater runoff, while 52% cover flash and riverine flooding, 29% tidal flooding and 16% seawater flooding. Amount in US dollars AIG shareholders are claiming from the US Government for taking an 80% share in the company to save it from collapse. Professional Broker, Sean Long of Willis; Emerging Professional Insurer, Hayley O’Neill of Lumley; Broking Office, Crombie Lockwood; Claims Professional, Myles Noble of Crombie Lockwood Wellington. Loss Adjuster/Assessor, Gillian Stretch, Cunningham Lindsey; Innovation, Stream Group; Support Services to the Industry, DLA Phillips Fox. Estimated liabilities in NZ dollars of failed New Zealand insurer Western Pacific. There’s nothing like the threat of really bad weather to make people think about their insurance. The Bureau of Meteorology (BOM) says this summer could see another La Nina event develop, leading to higher than average rainfall across northern and eastern Australia. Just like last summer. Shortly after the bureau’s report came an announcement from the Queensland Government that it has bought $53.6 billion of reinsurance cover for its property assets. But despite “an exhaustive international search,” the state’s 150,000km of roads will remain uninsured. The Government was criticised after the summer floods for not buying reinsurance to cover heavy losses to infrastructure. The cover will cost Queensland $25-$30 million a year and has a $20 million excess for single events and $50 million for natural disasters. The popular rural image of Thailand is one of bucolic beauty, whereas much of the country is home to tens of thousands of foreign-owned factories where global manufacturers take advantage of the country’s cheap workforce and friendly laws. Trouble is, much of Thailand is flood-prone, and this year heavy and widespread rainfall over three months led to the worst floods in 50 years. More than 600 people died and seven major industrial estates housing around 10,000 facilities – about 450 of them owned by Japanese companies – were flooded for weeks during October and November. The result has been global shortages in goods ranging from vehicles to electronic components, and flow-on problems for insurers. The cars pictured, among thousands submerged for weeks in factory holding yards, were built for export. The United Nations decided ages ago that 2011 would be the Year of Forests, but for the insurance industry the picture at left is a stark reminder that this has really been for us the Year of the Natural Catastrophe. There have been massive floods in many countries, not least Australia; and earthquakes in New Zealand and in Japan, where the tsunami that followed was truly horrific. Now we’ve had another bushfire in Western Australia. It’s therefore almost embarrassing to admit that this has been an interesting year for journalists who cover insurance. The editorial team that produces our weekly online service insuranceNEWS.com.au and this magazine have covered the catastrophes from many angles and viewpoints, and the stories just keep coming along. Our philosophy isn’t to follow the “insurance” stories that find their way into the general media and television, many of which are ignorant and misleading. We’ve stuck to our beat, concentrating on the stories and the issues that really involve the industry and the people who work in it. In the process we’ve gathered a host of contacts across the country and internationally at every level of the industry who are willing to speak to us and share their knowledge and viewpoints. Clarity in reporting comes from curiousity, research and phone calls and rarely from blind reliance on media releases. And as newspapers become more haphazard in their approach to news, the important insurance issues are usually ignored. We know what they’re missing, so industry professionals and even companies across the region have come to rely on us for information that helps them understand what’s going on. As a result our subscription list grows daily. We’re finishing the year with more than 17,800 subscribers for the weekly news bulletin and some 7400 for this magazine. 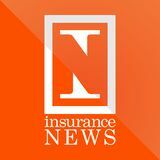 In November insuranceNEWS.com.au passed 2 million pageviews since January 1, and we’ve welcomed more than 130,000 unique visitors during the year, too. Our focus on our subscribers hasn’t waned, and it won’t as we move into 2012. New developments will be launched next year to enhance the value of our services to you. And all will remain free to subscribers. That makes us totally dependent on advertising revenue, of course, so please support the companies that support us! The Insurance News team join me in thanking our subscribers for their continuing support and interest during 2011, and we all wish you a relaxed and happy festive season. Three major Japanese insurers have already estimated their losses alone will be about $3.46 billion, while AM Best put total insured losses as high as $US20 billion. A troublesome mix for insurers Home units, cyclones and affordability raise another inquiry The Natural Disaster Insurance Review (NDIR) report expresses regrets that it did not have the means or the time to fully investigate the cause of “some very large premium increases” following Cyclone Yasi in Far North Queensland. It says rises of 300% or more have been experienced, “especially for home units”. “Such extreme price increases can occur for several reasons but, irrespective of the reasons, they are presenting immediate affordability problems and can also cause continuing problems.” The report treats home units in the same way as a detached house or any other type of dwelling, and the Government has been swift to react to the report’s comments as well as to allegations from Far North Queensland MPs that the situation has reached the point of an “insurance failure”. Two weeks after the review was released, the Government directed the House of Representatives inquiry into the insurance response to disasters to investigate the issue, starting with public hearings in centres between Mackay and Port Douglas in January. The inquiry by the Standing Committee on Social Policy and Legal Affairs will hear submissions from MPs that premium increases of up to 800% are being quoted following the exodus of some major insurers from the market. The new terms of reference direct the committee to inquire into strata insurance cost increases over the past five years, insurers’ ability to price risk and the accuracy of the data they use, as well as the extent to which there is a failure in the insurance market. The NDIR panel recommends that the agency it wants established to co-ordinate flood issues should also offer cover to insurers for cyclone risk on the same basis as for flood risk, but without affordability discounts. It also recommends an investigation to ascertain whether there is a basis for granting affordability discounts for cyclone risk, along the lines of the recommended flood insurance discounts, for homes and home units in northern Australia. The definition is: “Flood means the covering of normally dry land by water that has escaped or been released from the normal confines of: A. any lake, or any river, creek or other natural watercourse, whether or not altered or modified; or B. any reservoir, canal, or dam.” Mr Trowbridge told Insurance News the issues of affordability and availability have to be tackled simultaneously because while it’s simple enough to require flood cover as a standard inclusion in policies, “that wouldn’t address the question of affordability”. The panel says premium discounts “are a prerequisite for homeowners to be able to afford to purchase flood cover, which in turn makes it possible to deliver on the conclusion that unequivocal insurance coverage for flood is central to addressing the community need”. Under the panel’s plan for high-risk properties, insurers would retain and price a portion of the risk, with the remainder ceded to the reinsurance facility at a discounted reinsurance premium. Policyholders receiving full discounts would pay for that portion of the risk retained by the insurer, and nothing for the remainder of the risk up to $500,000. Once the risk exceeds that figure, policyholders would have to pay the full cost of the portion of risk exceeding $500,000. Homes at “high” and “extreme” risk of flood would be provided with discounts initially, but would be regularly assessed for mitigation work. Flood premium discounts and the reinsurance facility wouldn’t be provided to small businesses – at least initially. But all insurers offering small business insurance would be obliged to include flood cover on an opt-out basis – instead of an opt-in/opt-out basis as at present – in all of their small business package policies. The reinsurance facility would have two primary functions: to deliver discounts to flood-risk insureds, and to provide flood reinsurance capacity to the insurance market. The facility would have an excess of loss arrangement whereby insurers would retain and price a “first loss” portion of each policy on a commercial basis. It would also have a “facultative/obligatory” reinsurance treaty that would allow insurers to cede individual properties to the pool if they wish – but the pool would be obliged to accept them. The proposed agency would charge insurers a small administrative fee for each policy ceded to the reinsurance facility. The panel says home building insurance policies providing sum insured cover should be modified by the end of 2014 so they include replacement value cover in the event of total loss of the home. Mr Trowbridge referred to the panel’s work over six months of consultations, submissions, speeches and closed-door discussions and told Insurance News that the NDIR report would be a “once in a generation” opportunity to solve a problem that has affected communities across Australia for too many years. The last such examination of the industry’s response to flood was compiled in 1974. Two years later the Fraser Government agreed to introduce a natural disaster insurance scheme and established a working party of officials to formulate it. The working party recommended that insurers form a pool to offer natural disaster cover for households and small business, while the Government would offer the pool reinsurance for catastrophe risks up to a defined limit to private insurers and cover earthquake, flood, tropical cyclones, landslide and storm surge. Insurers didn’t like the Government’s model, and it was finally junked in 1979 by then Treasurer John Howard, who said it would be “inappropriate on budgetary, technical and insurance grounds”. A consultation paper is available at www.ndir.gov.au and submissions can be made until March 30. This is the best opportunity in 32 years to finally solve the problem, and just as in 1976, insurers’ support * will be crucial to its acceptance. Queensland Resources Council it will enter the wet season this month with enough water still on mine sites to fill Sydney Harbour. Under environmental legislation, water is presumed to be contaminated as soon as it falls on or otherwise enters a mine site. There can be issues of salinity or base metal contamination, so the miners can’t simply pump floodwater into a convenient river system. Mr Roche says that as a result, coal companies have invested heavily in preparations for this summer, building more water storage, pipelines, pumps and water treatment plant. And when they get the insurance questions resulting from the floods of 2007/08 sorted out, they’ll start to look at the issues around the floods of last summer. Hopefully the coming rainy season won’t keep the miners – and the insurance industry – * playing a perennial game of catch-up. in Australia and New Zealand used up all the usual backup resources of the loss adjusting sector and made normal business models obsolete. And he describes the need to import loss adjusters from other countries to assess claims in a timely manner as a “no-win situation”. “The challenge when resources are imported where there is nil or limited knowledge of the market is to ensure appropriate induction and supervision,” he says. “Unfortunately there is often limited allowance in the timeframes or cost models for this to be reasonably adequate.” Following the catastrophes, AICLA convened a meeting of senior industry personnel including loss adjusters, insurers and reinsurers to discuss issues arising from the events, with a further review meeting to be held soon. “One of the discussion points will be resourcing issues, particularly any associated with the importation of offshore adjusters,” he adds. As closer inspection has revealed, there are wider issues affecting the performance and professionalism of loss adjusters than simply being overwhelmed by an unprecedented proliferation of disasters. Mr Lavin says a “dumbing down” of the loss adjusting process has followed the drive from insurers to push fees down. But he admits that loss adjusters “have traditionally not been good at demonstrating the value they provide – hence the full value of engaging a qualified loss adjuster is often not appreciated and we end up with focus on a fee rather than the overall outcome”. While there is no simple answer to the bigger picture problems facing the adjusting profession, whether the mud directed at their performance last summer will stick remains * to be seen. its name to Crombie Lockwood. The company was acquired by Wesfarmers in 2007. Today it is believed to be the largest brokerage in New Zealand, with more than 400 staff. It continues to acquire companies, too. Its most recent acquisition was Christchurch-based FMR Risk in April, which is providing Crombie Lockwood with enhanced strength in the New Zealand corporate market. of three brokers that fit the surveys measures of small, medium and large. Macquarie notes a “great discrepancy in levels of revenue per staff member across lower, medium and higher revenue businesses”. The median revenue per principal was $1,125,400, compared to $1,047,642 in 2009. Discussions with small to medium sized brokers indicated that $1 million of revenue per principal is a key target that many aim for. The average revenue to salary ratio is 2.9. The business has gross written premium of $10.14 million, of which 19% is from domestic policies. Revenue is $1.85 million, of which 32% is spent on salaries. This year’s median result of $1.85 million is slightly below the average revenue of $1.9 million recorded in the 2009 survey, “perhaps reflecting a softening market during that time”. The report says average revenue for an insurance broking business in this year’s survey was $4.57 million. “However, this figure has been influenced by the 9% of businesses that had revenues in excess of $10 million (some of which were significantly higher). “This reflects the Australian market, where a small number of brokerages and in particular the international players have revenues in the tens and hundreds of millions.” The net profit margin after principals’ remuneration is 22%, and the “typical” firm experienced profit growth of 10.5% in the 2010/11 financial year. Some 86% of the surveyed brokers increased their revenue in 2010/11 – 17% by more than 20% and 9% by more than 30%. The report says the high percentage of businesses that increased their revenue is not a surprise, given the increased focus on risk in light of global and local events, a slight hardening of the insurance market and the growing Australian economy. “This was a slight increase on the 2009 survey, which reported revenue growth by 84% of businesses, continuing a growth trend that has been seen over a number of years.” Smaller firms were significantly more likely to have achieved “super” growth of more than 30% compared to their larger counterparts. Macquarie says those brokers who grew their revenue in the past financial year “have done so through their own endeavours”. The top two contributing factors to this growth were listed as increased sales and marketing activity, and new products and services. “Firms that declined in revenue typically blamed external factors outside their control,” the report says. Brokers also listed increasing their fees as one of the top three ways to increase profitability. Mike Burgess Chief Executive, Scott & Broad/Clark Pacific, Sydney Scott & Broad can trace its origins back to 1919. It purchased Clark Pacific in January 2007 and offers a wide range of value-added services to clients. Size: Doubling the size of your brokerage doesn’t automatically mean doubling profit. We’re all looking at our back-office systems and our overheads. The focus for 2012 is to become more profitable, not just bigger. Revenue: Revenues are moving up because commissions are attached to higher premiums. But the real driver is hard times. If we go back five years when everything was booming, insurance was down at the bottom of people’s to-do list. In hard times, insurance is rising towards the top – people are buying more insurance not less. Expenses: The biggest expense to any brokerage is always wages. The ratio to income needs to be contained to below 50% of income. Profitability: Brokers who have created different revenue streams are growing their business quite nicely. Small brokers who haven’t bothered to diversify revenue streams will find it hard to grow revenue. Brokers who have diversified into other income streams, such as risk management and workers’ compensation management, can expect better profit margins. We’re doing better than last year for all those reasons. You have to take the initiative for your own profitability rather than rely on set commission levels dictated by insurers. For example, if the insurance company says you can only have 5% commission rather than the 10% you got last year, you need to adjust your margins to meet budget. Some brokers still don’t react and keep fees and commissions the same – even though expenses are going up. They let their profit margins be dictated by the level of commission they’re allowed by an insurer. our business both through acquisitions and mergers. I’m confident we’ll have steady growth next year. Clients are looking for more services not just insurance so we’ve hired more staff and we will continue to hire more, both in sales and back office. Valuations: You use both measurements – revenue and profit. People don’t just walk in and say we’ll pay you three times revenue if your profit margin is only 5%. People don’t want to pay for a mess and a heap of expense that goes with it. Chris Dalton Managing Director, Insurance Broking Australia, Gold Coast Four years ago Chris Dalton sold his old brokerage, which he’d had since 1988. Now he concentrates on exceptional service and enjoying the laidback Gold Coast lifestyle. Size: If you look at the top end of the scale – legal, accountancy, banks, all the professional areas – you will only do well if you’ve got the top quartile of clients who are more lucrative. We’ve got the small-end clients – retailers, factories and traders, not top-end manufacturers or ASX200 companies. There’s been a grouping together of smaller brokers in clusters like Steadfast, just to try to be able to reduce processes and costs and also have a stronger association with insurance companies – to have more clout not just with products but with income as well. If you’re with Steadfast you might get an extra one or two percent in commission. It might not sound much, but when you’re smaller it can add up. Revenue: Commissions are still the biggest source of revenue and some brokers are charging higher broker fees. I look at some of their charges and think, “If I got a fee as high as that I’d be embarrassed”. Some of them are quite substantial for the work that’s been done. But that’s a sign of the times. Expenses: Insurance staff are some of the best paid workers in Australia for what they do, and compared with what banking and legal administration staff get paid. That’s a cost everyone has to wear. In regional areas, for brokers like us the clients are mums and dads, start-ups or slowly going broke. You’ve got to work smarter, not harder. I won’t be hiring more staff. Profitability: Same-same. Nothing huge. We are just ticking along. But next year I’m going to be more focused on the broking business and less on property and other investments. But we are still growing all the time, and 75% of our new business comes from other brokers. People don’t realise what they are not getting until they talk to someone like us. As soon as they strike a new broker who says I’m going to come around and have a chat, they’re amazed. Straightaway, you’re through the door and you haven’t even given them a quote. It’s because no one has come to see them for years. Mergers and acquisitions: I’ve had a couple of approaches from other brokers. Four or five small brokers on the Gold Coast have sold out to large brokers and another seven or eight have started up, like me. They’re like mushrooms. It’s a pretty healthy market. Technology: Everyone is looking at new innovative platforms. It depends on who is fastest and sharpest. It’s going to be quite interesting to see what happens when broking systems use cloud technology rather than the dinosaurs under the desk. Social media takes up a huge amount of time for no real result. I prefer to jump on my bike and ride to the beach. I’ve got better things to do. the business has been built on the ability of our people to support and advise our clients who need and want more than traditional insurance broking services. we are opportunists and if there is a likeminded business to us on the market we would certainly want a seat at any table if there’s any discussions to be had. It’s a tough, rewarding and career-building industry, but the industry struggles to attract solid young people. There’s no apprenticeship, and while there is education there’s no real insurance degree. People just fall into this industry. Valuations: Every business you look at is different and every business has their own methodology and perception of valuation. tion, which may also contribute to their solid year-on-year growth. Have you been approached to sell or merge? Points worth considering: The report carries commentary by the Macquarie Insurance Broking Team, based on their market knowledge and wider economic research. Some comments: Only 15% of principals are female. Does this match the dynamics of your client base? Would greater diversity create better decisionmaking? Is there a competitive advantage to be gained for brokers with greater gender diversity at principal level? Selling: Brokers must demonstrate their value as an adviser to their clients and be clear about the work involved in placing or renewing risks. Fees: Many brokers don’t charge sufficiently for the value they provide, and are fearful of increasing their fees. The key is to be clear on your value proposition and confident in communicating it. The client mix: The loss of one major client can have a significant impact on your business. Keep an eye on your client concentration. Marketing: It’s important to ensure that marketing spend is executed on carefully considered campaigns, as opposed to spending for spending’s sake. Staff: Do you have the right people in the right roles to effectively grow your business? some level, that hasn’t meant a seachange in the way we approach risk or the market in general, or our group’s attitude to the market.” He says the Ace approach to its property, casualty, financial lines and accident and health business in that corporate space is very much centred on individual risk underwriting, which makes it difficult for him to speak generally about rates in that part of the market. “Larger risks are really where individual risk underwriting comes to the fore,” he says. “That’s what we practise. We see ourselves very much as an underwriting company that looks at each risk very much on its own merits, based on careful analysis.” Mr Ward says that with many long-term relationships in that sector of the market, taking a short-term view isn’t a realistic option. The client relationship with Ace, its risk management practices and Ace’s risk appetite are all factors in setting the terms, conditions and price. “It’s very difficult to say something generic about what is happening with pricing, because you often find you’re comparing apples with oranges,” he adds. Part of that underwriting process for large risks includes the use of risk engineers and other technical experts in specific fields that help Ace’s underwriters make informed decisions while also providing risk management and mitigation advice to clients. That’s one of the advantages of being a global company, Mr Ward says. If the required expertise isn’t available locally, Ace will usually have an expert in another location who can be brought in to assist. “It’s a service that we see as a key differentiator, and something that our clients very much appreciate. It’s been part of our corporate DNA for some considerable time, and it’s something that we continue to develop and invest in. “I don’t see it ever not being part of the mix, because it goes back to that whole issue of being an underwriting company and being able to assess risk professionally before you can go to the next step of pricing it and providing coverage.” He says that while the local division of Ace is often utilised to fulfil the local segment of a global program for a foreign-based multinational, it also looks after the insurance needs of a large number of Australian-domiciled businesses. In fact, the locals comprise the majority of its corporate book. Assistant Treasurer Like him or loathe him – and there are plenty of people in both camps – no one in the insurance industry can afford to ignore Bill Shorten. No wonder; he’s doing more than anyone right now to force the industry to confront long-ignored issues, and keeping us on our toes on other issues as well. As our cover story on Shorten in the April/May edition of Insurance News stated, he “won’t let the [flood insurance] issue go until it’s sorted out, once and for all”. During the flood dramas at the start of the year he was all politician, talking nasty and putting the boot in. Since then he’s been a demanding driver of change, but happy to apply plenty of discussion and negotiation in the mix. As one source put it: “He works hard to understand the problem.” In the process he’s pushed through a workable standard definition of flood, formed the Natural Disaster Insurance Review to put up the ideas and a parliamentary committee inquiry to keep the pressure on. He found $12 million to kick-start the national flood data collection program insurers have been demanding, and now he’s digging around the vexed question of strata title cover in Far North Queensland. Shorten’s Future of Financial Advice (FOFA) reforms this year were aimed at sorting out the sales of life insurance into superannuation, but there was some overlap for general insurance intermediaries. The brokers avoided his ban on commission payments, but there are still plenty of traps hiding within the “best interests” provisions of the FOFA reforms. Often touted as a future prime minister, Shorten has been a convincing performer in the financial services sector during 2011. And somehow we don’t think he’s finished with tinkering around the insurance industry just yet. Decisive and well connected through his senior management role within the Wesfarmers conglomerate, Rob Scott does what has to be done. He moved swiftly earlier this year to address the weaknesses that had stymied the Insurance Council’s ability to present a coherent industry view during and after last summer’s floods. He has had to be on the front foot all year with a federal government determined to force reforms on to the industry, and from all accounts he has performed well in the backroom role that presidents inevitably adopt. Business-wise, his collaboration with Wesfarmers sister company Coles is making a big push into the highly competitive direct motor insurance market, but it hasn’t been a positive year for his other insurance arms thanks to the region’s natural disasters. Scott oversees direct and commercial insurance operations as well as brokerages OAMPS in Australia and the UK and Crombie Lockwood in New Zealand. Membership of the Wesfarmers group and its enormous capital base helps not only acquisitions but also swift changes in direction, so expect Scott to be in the thick of the action in the next year. It’s been a tough year for IAG and its share price has taken a hammering, but Wilkins continues to be highly regarded in business circles for his straight-shooting advocacy of industry issues and his patient overhaul of troubled parts of the IAG empire. The costly UK operation is slowly improving, and IAG has landed a useful joint venture in China to add to its insurance partnership with the State Bank of India. Growth in Asia is the way ahead for IAG, and Wilkins is patiently steering the group towards happier times. The group’s dominant “mums and dads” shareholder base is sometimes a curse but it can be a blessing when it comes to holding back acquisitive rivals. Group Chief Executive, Suncorp It hasn’t taken Patrick Snowball all that long to make the cumbersome Suncorp group rather more nimble. And having got the measure of his diverse range of brands and financial services – everything from a bank to a life insurer and everything between – he decided this year that he’ll stick around beyond 2013 until at least 2015. “I’m really enjoying the job, I’ve got a great team of people, I think we’ve really straightened out and stabilised the business,” he told shareholders at the annual general meeting in October. These days he talks less like a visitor from London and more like someone running a big Australian company that is performing better than it has for some time. He has his own business contacts and his own style, and he’s not afraid to lead from the front on issues such as offshoring jobs. Expect to hear more from him this year as the industry struggles to deal with the reaction to higher premiums. His opportunity came in July when Frank O’Halloran agreed it was time for the next generation to step up. Fagen is seen as tough and capable. Brokers love the way QBE does things, and Fagen can be relied on to keep the business bubbling along profitably. Growth for QBE in this part of the world is a tough proposition, but Fagen will have his eyes peeled for opportunities – probably bolt-ons. Robert Kelly Executive Chairman, Steadfast He knows everyone in the industry who’s worth knowing and seemingly everything that’s going on as well. The strongarm boss of the country’s largest independent broker group is building Steadfast into a major force in the industry, with a public listing and the controversial but inevitable “virtual underwriter” platform just two of the projects he’s working on. A passionate, outspoken, muchadmired bulldozer. Reinsurers rule right now, and Munich Re dominates the market – discreetly, of course. Eder has been around the local scene long enough to know which levers to pull, and he did a good job after the disasters making sure opportunists understood why reinsurers weren’t going to abide ex gratia flood payments. His Great Lakes insurance operation isn’t particularly popular with insurers, who agitate about conflicts, but Eder mixes a good business brain with the skills of a diplomat. Terry Towell Managing Director, Allianz Australia You don’t hear much from Towell in public these days, but that doesn’t mean he isn’t working behind the scenes – and his opinion still carries plenty of weight with his peers and the powerful. Still one of the directionsetters for the industry, he has many years of experience to call on. Towell’s career as a chief executive is slowly nearing its end, and there’s plenty of speculation about the Allianz succession plan and what he’ll do next. This old-school insurance conservative is too valuable and too tough to simply let go. Chief Executive Personal Insurance, Suncorp Milliner just shades Anthony Day at No 9 because he represents Suncorp on the Insurance Council board, which gives him additional gravitas. A mastermind behind the successful Suncorp recovery strategy, the relatively high profile of such brands as AAMI mean Milliner’s name is well recognised in many circles. Capable and innovative, he’s well liked and very focused. Shane Doyle Chief Executive, Zurich General Insurance Appointed to the top job in March, Doyle hasn’t been slow in making his mark at Zurich, which now has separate general and life insurance arms. His operation has been thoroughly worked over in the past year as he fine-tuned the operation and put new people in senior positions. Doyle is a persuasive public speaker with an incisive intellect and excellent relationship skills. At the age of 42 he’s one of the new generation of insurance industry leaders who are making their mark. Leon d’Apice Managing Director, Ebix Australia If you want to talk insurance IT – and everyone should be – you’ll eventually find yourself talking to Leon d’Apice. Through global parent Ebix his operation has enormous capacity to introduce proven products that can immediately meet emerging local needs. The urbane boss of not only the industry’s largest transaction platform and most of its broking systems is relaxed about emerging competition because, like it or not, right now he holds the whip hand. No offence intended to the people running the general insurance industry’s various representative associations, but John Brogden has the goods. An experienced politician with a good grasp of the issues, he’s admired for his ability to communicate complex viewpoints and articulate some big visions. Journalists like him for his willingness to make time for them and politicians listen to him. He can’t be ignored because he represents a very powerful constituency – some of whom have interests in general insurance. Look and learn, people. The Australian-born boss of the second giant European reinsurer has had his hands full in the past year, thanks to a dominant position in the local catastrophe risk market. Senkevics has pushed catastrophe bonds as a solution to Australia’s rising risk exposure, particularly in government infrastructure. Rising property reinsurance rates are expected to cause a stir in January, and Senkevics will likely be one of those who can provide a rational and authoritative narrative on the reasons. Privately owned but globally focused Hollard is an unstoppable force. Enthoven, son of the company’s South African founder, continues to invest and grow the business in Australia, and his companies now have partnerships with 22 brokers, 12 underwriting agencies, four insurance operations, a direct insurance operation of its own (Real) and a growing portfolio of direct insurance services launched this year and also in development for giant retailer Woolworths. The Hollard operation is now a significant player in the local market and has an impressive global presence as well. It’s only going to get bigger. Aon is big by any measure. As a broker it’s huge. Nevett has at his fingertips an organisation that can not only place commercial insurance of all kinds but also draw on Aon’s global knowledge bank to provide highly specialised advice for clients. The world of the mega-broker is very different from that of the next tier – relationships with insurers, the variety in deal-making and the size of the clients. Nevett is very experienced in both underwriting and broking, and is regarded as an accomplished networker. He’s also accessible, which makes him a favourite with local business media. They’re reforming insurance all around the world. Laughlin has responsibility at the regulator for risk insurance, so he will lead the push here. It will be interesting to see how he and the organisation handle an increasingly interventionist federal government, too. Like Aon, Marsh works in a rarefied world where it seems a bit above the everyday affairs and issues that smaller broking groups grapple with. And while John Clayton can wield considerable influence in the market, Marsh has always been careful to stay engaged with the wider industry. Clayton is without doubt a very busy person, but he makes time for the occasional speaking engagement and isn’t afraid to put a controversial view when the need arises. Senator Mathias Cormann Federal Opposition financial services spokesman He has grown in the role since his appointment in October last year and has attracted a good industry following. There’s no certainty Cormann would keep the financial services portfolio in the event of the Coalition taking power within the next couple of years, which would be a shame. He’s worked hard to understand the industry. Tipped as the logical successor to Frank O’Halloran, he’s focused on the global business, but the restructure of the Australia Asia Pacific division and the subsequent departure of Vince McLeneghan demonstrate Neal’s growing influence within the group and his ability to make big changes. After a chaotic summer of disasters (in so many senses), the Insurance Council is beginning to get back on track, and has recently added a much-needed communications professional to its ranks in the likely event that last summer happens all over again. Whelan had an unenviable task last year putting the industry’s views in the face of a torrent of criticism from the media and a seemingly endless number of official inquiries. Where are they now? Frank O’Halloran Chief Executive, QBE Group – #1 last year Dropping Frank O’Halloran from No 1 position will doubtless raise a few eyebrows, and we don’t doubt this much-admired businessman could command any audience he wished, if he wanted to. But O’Halloran is focused on QBE’s global pond and building up to an orderly succession – and Australia might be home, but it’s really a small tributary with little potential for dramatic growth these days. O’Halloran only gets the headlines when he announces half-yearly and annual results – which haven’t been as warmly received as they were a few years ago. Peter Harmer Chief Executive, CGU Insurance An insurer turned reinsurance broker and then commercial broker turned underwriter, Harmer is bringing a new perspective to a company that has struggled a bit to build a more positive market presence. He has an impressive track record, including running mega-broker Aon here in Australia and the UK, and was also chairman of the Lloyd’s Market Association. Appointed to the top CGU job in November last year, he has the experience and capability to go far in IAG. Vince McLeneghan Chief Executive, QBE Australia Asia Pacific – #14 last year Left the company in July when the division was restored to two separate divisions after 11 months. Left the company in March after a global restructure split the local operation into general insurance and financial services units. Left the company in late October when a restructure caused his job to disappear. tions as to who is behind the move. The finger has been pointed at the unionowned industry superannuation funds which have run a long campaign against advisers being paid commissions. It has also been suggested the Assistant Treasurer Bill Shorten, who comes from a union background and counts superannuation among his ministerial responsibilities, has been willing to agree to their demands. So will FOFA fix up all the problems of the past five years and help the insurance industry – both life and, by default, general – deliver better service? Most critics say the reforms will achieve nothing more than create additional compliance and paperwork. The general and life insurance industries have played no part in the problems of the past five years – the collapses have been created by investment products. But as brokers and life insurance advisers hold an Australian financial services licence, they are inevitably caught up in other people’s misdemeanours. There is also no guarantee this government will run its full term, in which case FOFA could potentially become one of those bills that sink without trace. The Opposition hasn’t said it will sink FOFA, but it has said it will repeal a number of clauses including the controversial “opt-in” provisions. The first two bills are already struggling in Parliament with both being referred to committees that will not report until the first quarter of next year. And there is still a third tranche of the legislation to come with Parliament having risen for the summer. As a result of these delays, the July 1 2012 implementation date for FOFA is looking less likely although Mr Shorten is still sticking to that date. For many people on both sides of life and general insurance divide, that’s just about the only positive aspect of the whole FOFA drama. The Why a New Zealand court decision is rocking Australian business and insurers – and what to do about it By Mark Lindfield, Special Counsel at DibbsBarker, and Justin Coss, General Counsel at InterRISK Australia ONE OF THE MAIN FUNCTIONS of a modern directors’ and officers’ liability (D&O) policy is to help directors fund the costs of defending claims brought against them arising from their conduct as directors. However, a recent High Court of New Zealand decision calls into question the ability of insurers to make those payments where the value of the claims foreshadowed against the directors approaches or exceeds the policy limit of indemnity. The decision has implications not only for D&O insurance but also for other liability policies that offer cover for defence costs. payable under any insurance policy held by the person against whom the claim is made. Given the disagreement between Bridgecorp and the directors as to how the policy proceeds should be allocated, QBE refused to pay the directors’ defence costs. The directors asked the High Court to declare that the Act did not prevent QBE from covering their defence costs. Did the court find in favour of the directors? No. The court found that the purpose of the Law Reform Act was to ensure genuine claimants were not deprived of the benefit of an insolvent person’s insurance where, for example, the insured applied the insurance proceeds to other debts, engaged in extravagant litigation, absconded with the proceeds or even reached a corrupt bargain with the insurer. The court agreed with the receivers that if QBE was to pay the directors’ defence costs in circumstances where the value of the claims made against the directors exceeded the policy limit, there would be a significantly reduced pool of funds with which to satisfy their claims. The court held that this was contrary to the purpose of the Act. Therefore any payment by QBE of the directors’ defence costs would need to be made on a purely gratuitous or ex gratia basis because it would not reduce the funds available under the policy. Australian Capital Territory and Northern Territory. In fact, the court referred to the numerous authorities on the Australian legislation in finding support for its decision. As New Zealand High Court Justice Graham Lang noted, his decision produces “some unsatisfactory consequences”, especially since one of the main reasons companies and directors purchase D&O insurance is to provide cover for defence costs in relation to any civil or criminal proceedings instituted against them. The decision calls into question the availability of defence costs cover for Australian and New Zealand insureds in the event that claims are made against them that may exceed the overall limits of their liability policies. What is the insurance market doing in response to the decision? Stand-alone limits for defence costs have been available in Australian and the Lloyd’s market for some time. But historically the appetite for these products has not been significant, resulting in some insurers shelving these products. It now seems apparent that insurers who have ceased offering this product are dusting them off as more queries are received from the broking market. There is no doubt that the level of interest in stand-alone defence costs and statutory liability products is increasing. Nevertheless, it still seems surprisingly low. Insureds appear to be waiting for the outcome of the appeal in the Bridgecorp decision before making any decisions to purchase extra cover or to split the cover they already purchase between a pure side A policy for the benefit exclusively of the directors and officers and a separate side B and C policy for the benefit of the company. In the meantime, given that the outcome of the appeal may take some time, it is understood that insurers are working on new products which are designed to address the effect of the Bridgecorp decision and the uncertainty that it creates * in this area. Excess buydown cover is raising plenty of interest THE SPATE OF NATURAL CATASTROPHES in Australia this year has created a niche product opening for canny specialists. Excess buydown cover is now being offered for flood and cyclone in Australia and one firm is also expanding to cover earthquake excesses in New Zealand. professional civil liability of the investment management and the fund; the management liability of the directors and officers, and the direct financial loss suffered as a result of employee infidelity or third-party crime. She says risks to be covered include violations of investment management contracts, mismanagement or failure to supervise and non-fraudulent misrepresentation. These exposures and risks can change over time, so Chartis has designed its policy to take into consideration changes brought about by regulators, investors, third parties and employees. “The wording has been updated and refreshed to cater to the needs of changing regulatory requirements,” Ms Uhrik says. Chartis’ investment managers insurance complements the company’s D&O Gold product, with the D&O section extensions, exclusions, definitions and general provisions * upgraded to align with it. numerous ways. Customers and stakeholders lose confidence in the company, litigation is likely and the cost of doing business rises. “Recent headlines tell stories of lost or stolen personal information, customer records and credit card details,” Zurich National Underwriting Manager Financial Lines Susan Elias says. “Multiply this by thousands of records and the costs can be overwhelming. That has many of our customers highly concerned.” Tougher laws are placing increased pressure on companies to manage information with more vigilance. Zurich’s new Security and Privacy Protection policy addresses third-party liability and first-party loss. This includes privacy breach costs, digital asset replacement expenses and business interruption cover following a breach. The third-party liability provisions cover regulatory proceedings and cyber-extortion threats, and there is also an option to add internet media liability coverage. Ms Elias says the product is particularly suited to commercial retail, technology, healthcare, data processing and professional services operators. But she warns any company that holds data – whether it is about clients, suppliers, business partners or employees – is exposed to risk. “You can outsource processes, but you cannot outsource liability,” she says. “Our experts can help clients understand the risks of handling data and the risk of tougher protection laws.” The new policy is available on a standalone basis and has a simplified form that enables brokers to assess cover needs and make recommendations to clients. Other benefits specific to the Zurich policy include affirmative cover for security and pri* vacy legislation and regulations. sub-limits for statutory liability. An extra 12 months of cover is now incorporated for retired directors, taking the limit from 72 months to 84 months. The policy provides directors’ and officers’ liability, employment practices liability, statutory liability and company expenses. A Lumley spokesman told Insurance News a variety of businesses have taken up the cover. “We have seen particular movement in engineering, professional offices, cafes and restaurants, retail and transport.” Brokers can choose a comprehensive package with aggregate single or separate limits for each of the four covers ranging between $250,000 and $5 million. Management liability cover can be added during the policy term if there is an existing Lumley business package or it can be included on policy renewal. Lumley’s management liability product can be employed either as a section of the Lumley or Steadfast commercial business package or as a stand-alone policy. All are available through Lumley’s my.place@lumley platform via Sunrise * Exchange. Zurich global leaders meet local brokers Zurich Asia Pacific General Insurance Chief Executive Johnny Chen (left) met plenty of local brokers when he visited Sydney with several other Zurich leaders for his first board meeting in Australia. The company’s local management team threw a barbecue for Mr Chen and other visiting Zurich Global Corporate leaders – Chief Executive Thomas Huerlimann, Asia Pacific Chief Executive Vincent Vandendael and Chief Operating Officer Max Schoenholzer. Australia and New Zealand Chief Executive Shane Doyle hosted the event to connect local board members and brokers with the international visitors. Mr Huerlimann was fresh from presenting at the Asia Risk Council as part of the World Economic Forum, and spoke to the gathering about global risk and the opportunities and risks of “black swan” events on the insurance industry. Epsilon Underwriting turns 10 Peter and Lynn O’Shea, the owners of underwriting agency Epsilon Underwriting, celebrated their company’s 10th anniversary with 80 guests and staff at Sydney’s Ivy Penthouse. The O’Sheas started their business in 2001 as an agency to concentrate on liability insurance and the company has since written $100 million worth of business. Insurance industry guests including brokers and underwriters attended from all over Australia and some as far away as London. London guests were Lloyd’s Chief Underwriting Officer Darren Jacobs, CV Starr Casualty Underwriter James Cassidy, and David Robinson and Alastair Johnstone, both from the reinsurance section at Lloyd’s broker The Underwriting Exchange. Red carpet event for IBNA in Adelaide South Australian brokers can usually be relied on to do things in style, as more than 100 guests attending the inaugural IBNA SA members and business partnersâ&#x20AC;&#x2122; dinner at the Adelaide Entertainment Centre can attest. IBNA brokers rolled out the red carpet for staff from insurers and premium funders in a networking event that was a mix of business and pleasure. Entertainment was supplied by Adelaide band the Flaming Sambucas. IBNA is planning to make this an annual event. Women in Insurance celebrate 25 years Popular industry networking group Women in Insurance (WII) has celebrated its 25th anniversary with an event at Darling Harbour, Sydney after its annual general meeting. Brokers, loss adjusters, underwriters, lawyers, claims staff… in fact, women working in any area in insurance, are welcome at WII. Events are designed to foster networking, mentoring and sharing experiences in the industry. Over the past six years attendances at WII’s functions have increased from 170 to 500 people for each event. Newly elected president Emma Hoolahan says the association can look forward to another exciting year in 2012. “Women continue to excel in the insurance and financial services arena but there is still much to achieve at the most senior levels,” she says. “Through our events, we will continue to address issues relevant to women in the industry, maintain colleague support and advance our enormously effective networking platform.” Past president Sherrie Morton says the association provides an environment for young women to “make the essential contacts they need to progress in this industry”. Excellence recognised, knowledge shared at Lumley’s fleet event Lumley Insurance’s large fleet insurance customer base gets more than insurance from their insurer – they also obtain important information that enables them to run their fleets more efficiently through its annual benchmarking report. Using the data provided helps fleet managers to stay within – or exceed – the industry average over a wide range of measures. And Lumley’s knowledge base grows with its motor fleet business – it now insures more than a million fleet vehicles. The awards initiative is in its 17th year, with the insurer this year bringing major fleet operators together in Sydney for its annual Lumley Insurance Motor Benchmark Awards. More than 100 motor fleet professionals from across Australia were there to have their efforts to run safe and economical fleets recognised by their peers. The 2011 Benchmark Award for Inspiring Excellence in Fleet Risk Management was awarded to building materials supplier Boral Limited. “Boral demonstrated a strong focus on managing driver safety and controlling fleet costs,” Lumley National Commercial Motor Manager Rick Norrington said. Driving trainer Jeff Thomas and CSIRO vehicle environmental expert David Lamb made presentations at the event. Ghouls and ghosts at AILAâ&#x20AC;&#x2122;s Halloween party Halloween gave young lawyers, underwriters, brokers and loss adjusters an opportunity to break out of their business suits and party. The Australian Insurance Law Association Halloween party in Sydney attracted more than 500 members of its New South Wales young professionals network â&#x20AC;&#x201C; every one of them eager to be entertained. They were enticed with plenty of food and drink, a photo booth to commemorate the occasion, cartoonists to immortalise them, fortune tellers to foretell their potential and magicians to wow them. Awards and gifts were presented for best-dressed ghouls as well as lucky door prizes for the vampires, witches and warlocks in the room. Young professionals in the industry work closely together during the year and foster great business relationships. This Halloween event presented a great platform on which to foster less formal ties. Insurance Advisernet delegates learn the fun way Insurance Advisernet Australia (IAA) authorised representatives from across the country gathered in Port Douglas in Far North Queensland for their annual conference, proving by sheer weight of numbers that the organisation is growing fast. Some 300 IAA delegates and 80 insurers and industry partners flew in for the big event. There was plenty of motivational material between the serious business, with cricketing great Glenn McGrath and winning Americaâ&#x20AC;&#x2122;s Cup skipper John Bertrand sharing insights on how great teams work. Social media guru Iggy Pintado was also there to see IAA create an event hashtag which achieved more than 400 tweets by 60 users and reached an astounding 600,000 impressions. A well-equipped program eQuip, QBEâ&#x20AC;&#x2122;s special training initiative for young professionals, has held its annual graduation dinners across Australia to celebrate the successful completion of the formal learning component of the program. Hosted by QBEâ&#x20AC;&#x2122;s General Manager Australian Intermediaries Shaun Standfield, the dinners also provided an opportunity to officially welcome the class of 2012. Program graduates are invited to join the eQuip alumni so they can maintain and enhance the industry networks they have started to develop. eQuip gives participants resources and tools to maximise professional development and mature in their roles as the future leaders of the Australian general insurance industry. Over the next year the class of 2012 will complete three modules: leadership, insurance acumen and sales and relationship management â&#x20AC;&#x201C; the key competencies QBE believes will drive ongoing success. Our pictures were taken at the Melbourne and Adelaide events. departure of a Kiwi across The Ditch, the IQ of both countries was raised. Any other Kiwis at the top of the Aussie insurance tree you can think of ? In the world of awards, Insurance News stands aloof. We don’t enter awards for the insurance or publishing industries, secure in the knowledge that around 20,000 people vote for us every month by accessing our website. We’re also insecure in the knowledge that we might not win. It’s that word “win” that gets us. You “receive” an Order of Australia, but you “win” an industry award, like it’s a grand final instead of recognition of endeavours or brilliance. But we’re on the losing side here. Going by the plethora of awards being handed out around the insurance industry these days, maybe we should be getting in on the act not as receivers but as dispensers of awards, thereby avoiding our dignified but disappointed look as we clap for the winner. But being late entrants into the award-presenting game, we’re at a disadvantage because, frankly, there’s not much left. And the boss has made it clear that the cost of a piece of plastic mounted on a hunk of wood is way over the budget. Recognition alone will therefore have to be the reward. was “pin the tie on Noel”, an event in which chief executive Noel Condon and his neck stood in for the donkey’s, err, derrière. We gather Noel survived the efforts of staff to connect his tie to his oesophagus, although in our picture he does look like he’s trying to remember which clause in his employment contract obliges him to do this sort of thing. And that’s it for 2011. Roll on 2012. Have a great summer break, and may La Nina and all she stands for stay away.